Men and women have different needs when it comes to incontinence protection. 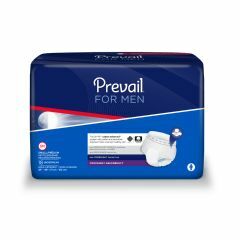 Incontinence products for men are designed for both comfort and protection. Products like TENA Protective Underwear and Depend Protective Underwear, wear like every-day briefs but contain absorbent technology that protects against medium to heavy incontinence. Other products like Mens Guards are designed to be worn inside normal mens underwear but provide great protection from stress or urge incontinence.